Protesters disrupted a U.S. side event on the future importance of fossil fuels at the COP24 conference in Katowice, Poland, on Monday. Separately, U.S. negotiators are helping to write a rule book that will help countries reduce greenhouse gas emissions. As the international climate summit in southern Poland enters its second and final week, most countries agree on the basic scientific facts: greenhouse gasses are causing climate change, and every country is feeling its effects. But the United States, under the leadership of President Trump, has taken a different view. The administration questions the overwhelming scientific evidence suggesting that human activity is causing the climate to warm. As a result, the U.S., which has been a leader in past negotiations, is playing unpredictable role in this year's summit. In the coming days, delegates from all over the world need to solidify the so-called rulebook they'll use to monitor their progress reducing emissions, finance the global shift away from fossil fuels and set even more ambitious emissions reduction goals in the near future. So far, countries have not successfully reduced global emissions; the biggest climate pollutant, carbon dioxide, increased in 2017 for the first time in years. One tool that was supposed to help countries set rules for reducing emissions is a report released in October by the U.N., which laid out in plain terms the scientific reality: Global emissions must go down 40 percent to 50 percent by 2030 to keep the Earth from warming 2.7 degrees Fahrenheit, which is the upper limit if we collectively hope to avoid the most catastrophic effects of climate change. 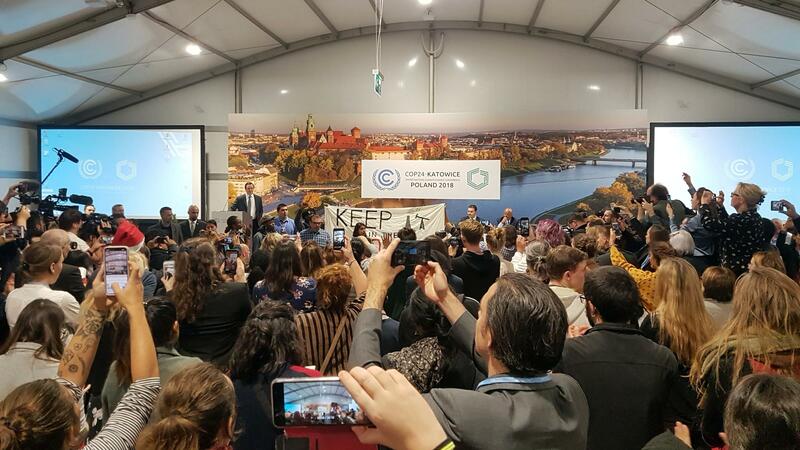 But over the weekend, that report became a sticking point for negotiators at the COP24 summit. A handful of countries, including the U.S., refused to sign off on a statement endorsing the report's findings. The U.S. joined Russia, Kuwait and Saudi Arabia in opposing an outright endorsement. That's in keeping with the current administration's climate policy. Trump announced last year that he intends to withdraw the U.S. from the Paris climate agreement in 2020, and the federal government has tried to roll back emissions regulations and has moved to emphasize fossil fuels. "I think the administration's posture, its threat to withdraw from the agreement, its rollback of domestic climate policies, certainly has weakened the U.S. influence in this process," says Elliot Diringer of the Center for Climate and Energy Solutions, a nonprofit environmental group in the U.S. The administration's position was made doubly clear on Monday, when the U.S. government hosted an event about the future importance of coal and nuclear technology. "The reality is that countries will continue to use fossil fuels," said event moderator Wells Griffith, the Department of Energy's leader for international energy issues. "We're here at the [conference] today to share our balanced approach to economic growth and environmental protection." "The United States is now the No. 1 combined oil and gas producer in the world," he said. "All energy sources are important, and they will be used unapologetically." At one point during the event, the majority of the people in the audience started laughing in unison, and then stood to shout protests, including the chant "Keep it in the ground." But those who have attended climate conferences for many years warn that political side events and squabbles over language can distort the role of the U.S. in the larger negotiations. Even as the White House is touting its message that fossil fuels are here to stay, the U.S. is involved in negotiations about how to phase out such energy sources. "The U.S. is quite active in the negotiations, especially on the transparency side," says Yamide Dagnet, a policy analyst at the World Resources Institute think tank and an adviser to some countries at this year's summit. She says the U.S. has spent decades pushing for nations to be more transparent about, for example, how they measure their own greenhouse gas emissions. Such questions are the foundation for the rule book being written this week, and the U.S. is still a crucial voice in deciding what happens. "The U.S. does remain a player. Other governments are interested in meeting with U.S. negotiators to see what they have to say," Diringer says. "I don't think you can write off U.S. influence in this process, but unfortunately the U.S. is no longer in a position to provide the leadership it has in the past." It's the final week of a major international climate summit. Officials from nearly 200 countries are meeting in Poland, and they have until Friday to agree on rules for reducing greenhouse gas emissions. And, of course, that's complicated. NPR's Rebecca Hersher is at the summit where she's noticed this year the United States is not the leader it used to be on climate change policy. REBECCA HERSHER, BYLINE: Most countries at the summit agree on the basic scientific facts. Greenhouse gases are causing climate change. And every country is feeling its effects, which is important because politically the negotiations about who does what to reduce these greenhouse gases can get hard. And in the past, the U.S. has been a real leader. Take the Paris climate meeting in 2015 when President Obama showed up in person to show he took the issue really seriously. BARACK OBAMA: Nearly 200 nations have assembled here this week - a declaration that for all the challenges we face, the growing threat of climate change could define the contours of this century more dramatically than any other. HERSHER: This year's climate summit is the most important one since then. This is the year when countries have to create a set of rules for how they'll track greenhouse gas emissions and hold each other accountable. But the U.S. is in a really different position than it used to be. Under the Trump administration, the U.S. is an outlier - a major industrialized nation whose leader doesn't acknowledge climate science. Today in Poland, the U.S. hosted a side event moderated by the administration's Head of International Energy Policy Wells Griffith. Seated next to him were panelists including executives and analysts from fossil fuel companies. WELLS GRIFFITH: So with that, I'll get started. Thanks again for joining us. HERSHER: He began by reminding the audience that the U.S. is not planning to honor its commitments under the Paris Agreement. GRIFFITH: The United States is now the number one combined oil and gas producer in the world. GRIFFITH: Fossil fuels will continue to play a leading role. HERSHER: There were more than a hundred people in the room. It seemed like most of them were actually there to protest. They stood up and started chanting. UNIDENTIFIED PROTESTERS: (Chanting) Keep it in the ground. HERSHER: Many of the protesters were young people affiliated with American climate activist groups. Elliot Diringer leads the nonprofit Center for Climate and Energy Solutions in the U.S. He's been following climate negotiations and the events that happen alongside them for decades. ELLIOT DIRINGER: This is a side event - so literally kind of a sideshow - and one of hundreds taking place at this conference. HERSHER: There are in fact dozens of events being put on by U.S. governors and mayors and businesses who are worried about climate change. Diringer says such events are more about domestic politics than they are about the climate negotiations underway. DIRINGER: You can distinguish between the messaging operation of the administration and the actual negotiating posture. The side event is about messaging. And it's probably meant as much for the political base back at home as it is for the folks here at the conference. HERSHER: However, he says, the Trump administration's dismissal of climate science has made the U.S. less of a leader in the negotiations. DIRINGER: Well, I think that the administration's posture - its threat to withdraw from the agreement, its rollback of domestic climate policies - certainly it has weakened the U.S. influence in this process. At the same time, I'd say the U.S. does remain a player. Other governments are interested in meeting with U.S. negotiators to hear what they have to say. HERSHER: In the coming days, U.S. negotiators are working behind closed doors and are expected to be a big part of writing the rules for the Paris agreement, even as their public-facing counterparts continue to disparage it. Rebecca Hersher, NPR News. Transcript provided by NPR, Copyright NPR.